We have been heating lots of rumors about the new Motorola Moto G7 smartphones, the handsets are now official. The list of device in the Moto G7 range include the G7, the G7 Plus, the G7 Power and the G7 Play, all of the handsets have different specifications. Designed to take your best pictures ever and keep up with your fast pace life, the new moto g7 plus is all about class leading camera technology and responsive performance. A little movement or poor lighting conditions are no match for the 16 MP dual camera system with optical image stabilization. Plus, new camera software and AI helps you shoot like a pro with amazing features like Smart Composition and Auto-Smile capture. You’ll never have to worry about missing a great shot thanks to the all-day battery with 27W TurboPower charging for 12 hours of power in only 15 minutes.1,2 Combined with the Qualcomm® Snapdragon™ 636 Mobile Platform, you have the fastest moto g ever. Its new u-design, 6.2″ Max Vision display gives you an immersive content experience with Full HD+ resolution, amplified by Dolby AudioTM crystal clear stereo speakers. 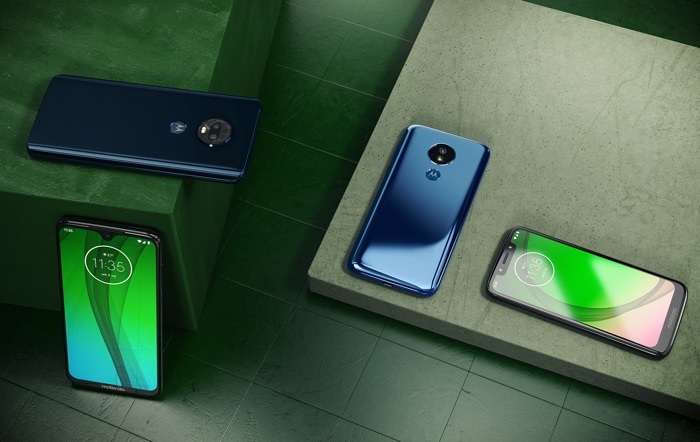 You can find out more details about all of the new Moto G7 smartphones over at Motorola at the link below.